Charlotte has been asking me to make slime for about a week. If you know this blog, you know we make tons of slime around here, and because of that, I know that 8pm at night is not when I feel like starting the adventure. But last night, with no homework and no cheer practice, I broke down and let her make some gorgeous striped purple and blue slime, inspired by a peacock. 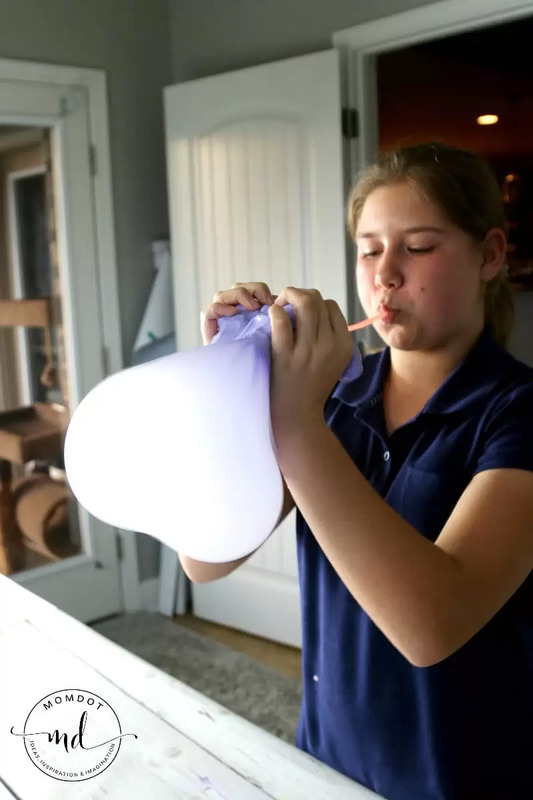 In addition, she wanted to make sure that I showed you all how to convert this slime into BUBBLE SLIME – a fun way to make huge massive bubbles and keep the play time going! This is one of my kids favorite things to do and I hope it brings you lots of giggles and oohs/ahhs as well. Before we make slime bubbles you have to make your homemade slime! If you have done your research, you likely know the most popular way to make slime is with Borax. Personally, I find that Borax is a pain in the tush and I like things easy, so without borax is how I make it. It’s pretty impossible to mess up your slime recipe this way. PRO TIP: You can also make slime by using LIQUID STARCH and glue . It’s a ton easier. Simply use about 1/3rd cup starch in 1/2 cup glue (you can stir in some food coloring or paint to color) and add starch little by little until you get the slime consistency you want. We use red solo cups to do this and once its mostly sticky, we pull out of the cup and start to mix with our hands. If the slime is still sticky, that means it needs more liquid starch. Just add little by little until you get the consistency you need. Please scroll to the bottom of article for an in-depth video. It can be pretty hard to find liquid starch, so pick this one up here (it’s the one I use) as well as a huge thing of glue so you can make tons of slime for all occasions. 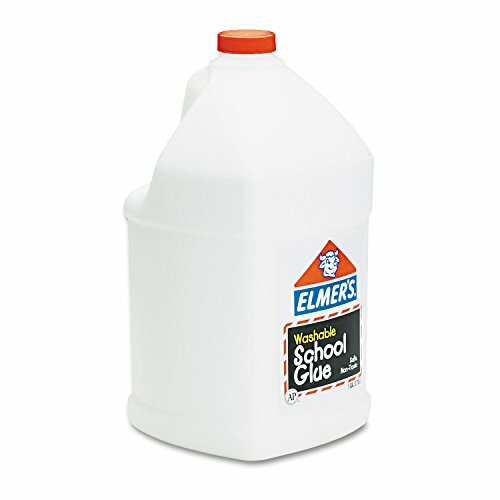 Buying this way is a lot more cost effective and once you start making slime, you will def want to have glue on hand! This went out of stock for a good month so make sure you buy it now that its back. 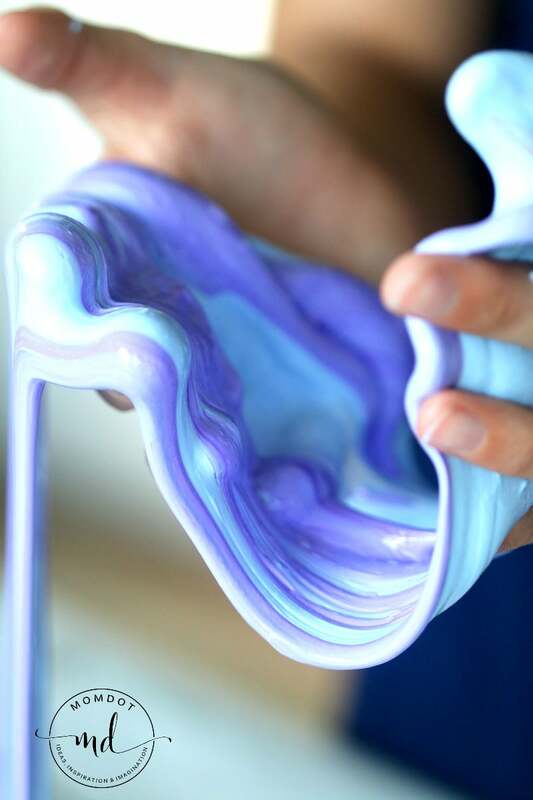 We are aptly naming this our PEACOCK Slime as we feel that the purple and blue represent a beautiful peacock! Using the above recipe, we created this super fun to play with and fun to look at slime. DO NOT BE AFRAID TO MAKE SLIME. Really, after the initial making it, it really does not stick to your hands or floor (probably carpet though, I wouldn’t risk that) and is easy to play with. We could not stop taking pictures it was so pretty!! NOW THE FUN STUFF!! After your slime is made, it’s so easy to make slime bubbles! 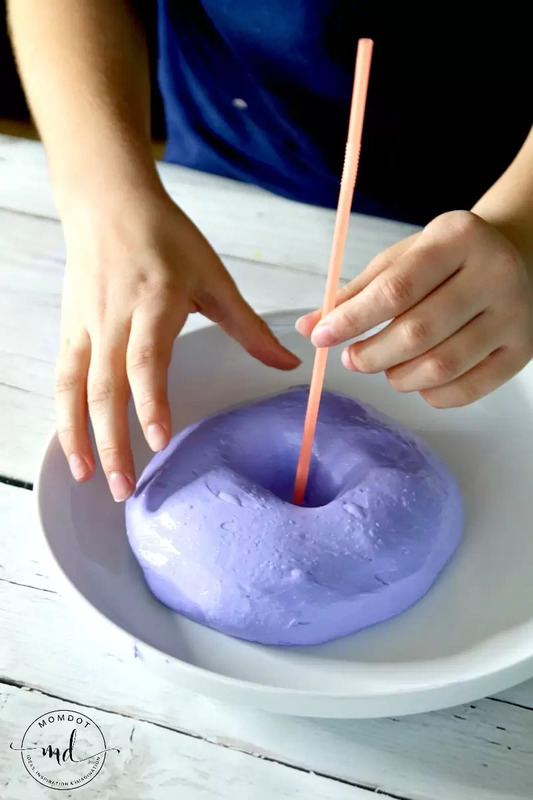 Just push slime into a ball, put your finger in to make a small hole, add your straw and fold slime around the end, and then blow! If you scroll to bottom of pictures, there is a SHORT VIDEO that will help! Need to see how making slime bubbles is done? Here you go! Plus bonus footage of our peacock slime at the end. I have a lot of people message me about this and other slime projects, wondering why their slime is so runny compared to mine. I did a live Facebook video that shows you the stages of slime from the goop to the solid mass above you see, so you can make sure you are on the right track. I also address some of the slime issues! Please watch because it will help you grow some confidence and make sure you get it right! Yes, there are two ads in this video near the beginning, which help pay for all this slime recipes and ideas that are provided here and we appreciate your support in keeping those costs down. Do not forget:Pick up your products so you can make all your fun slime! 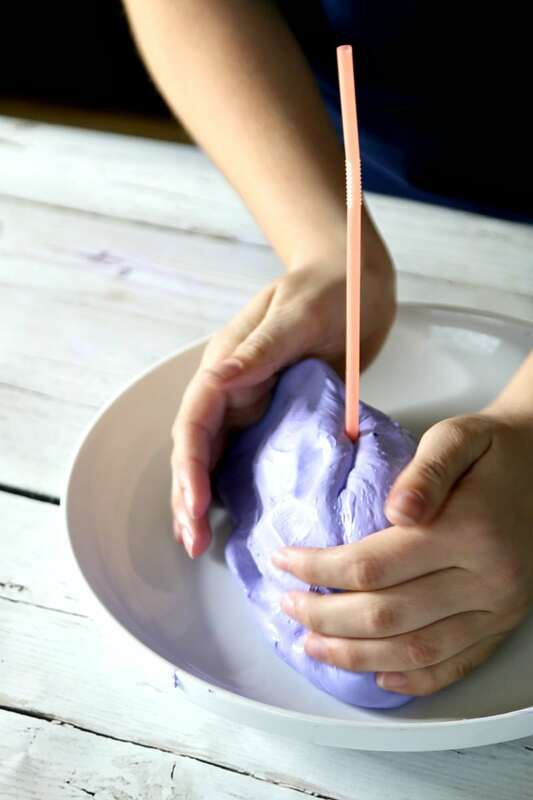 More amazing slime recipes here on MomDot!